These photos come to us courtesy of Charlie Gallagher. 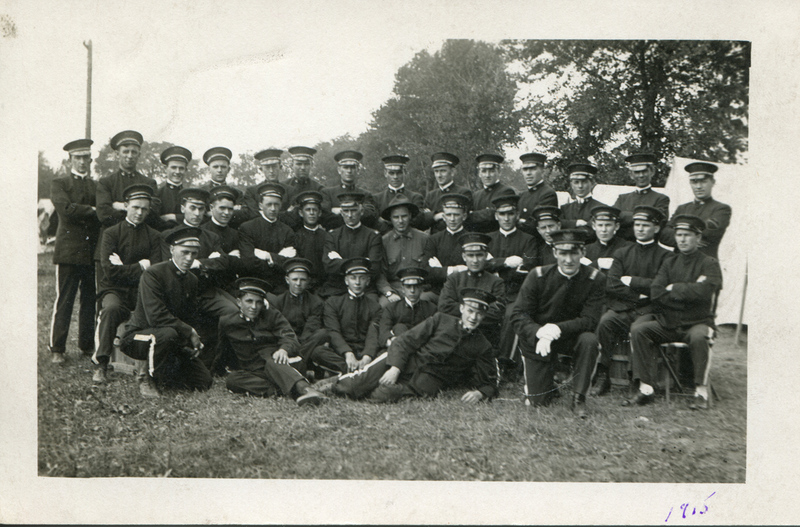 This one clarifies which band was photographed alongside the Citizens Band during the Pearl Jubilee in 1906. See the Citizens Band page for that photo. Charlie Gallagher wrote: "Here's St. Ann's Band 1915. 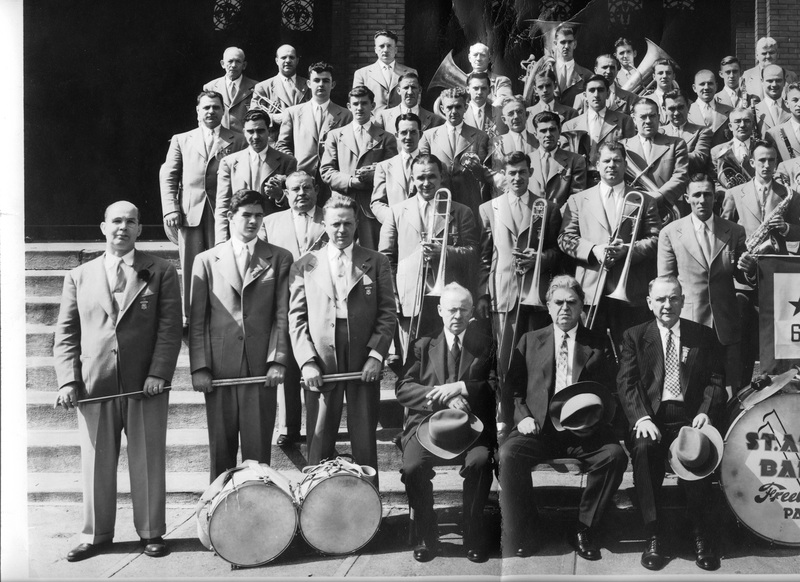 My Grandfather Bernard Gallagher is 4th from the right in the back row." 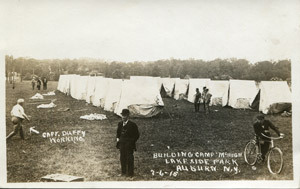 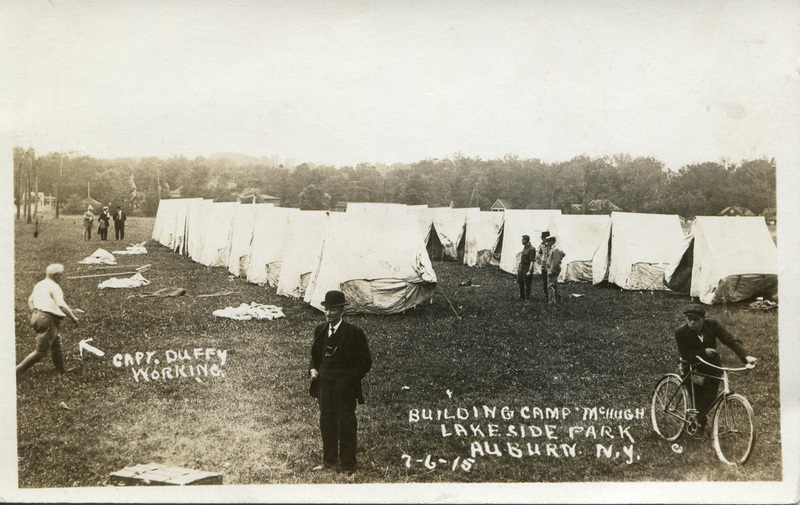 "Here they are setting up the tents!!" 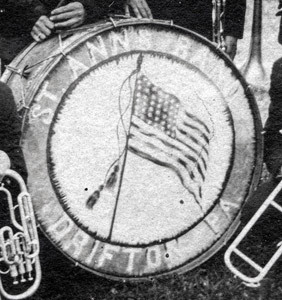 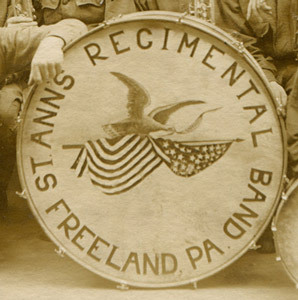 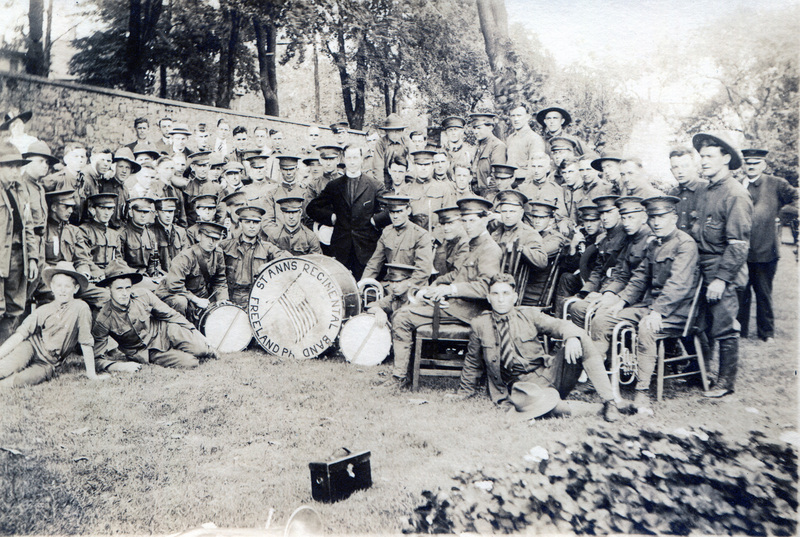 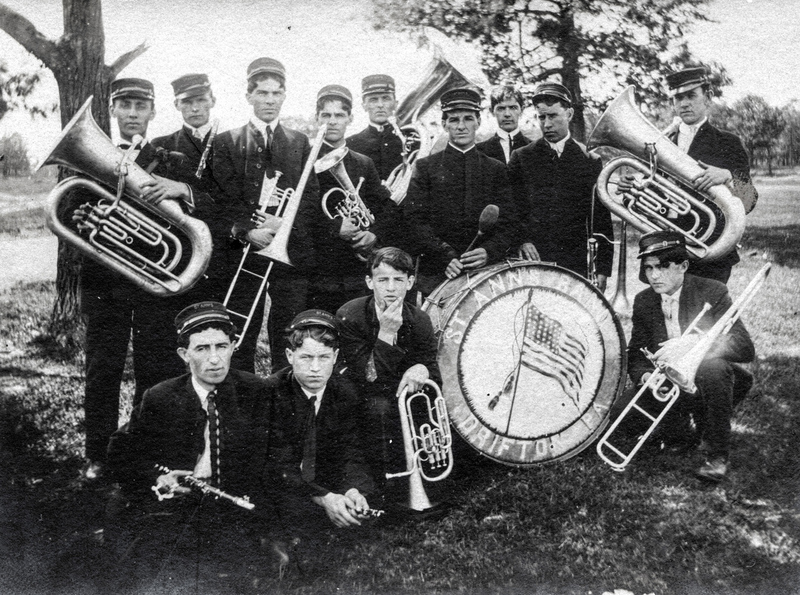 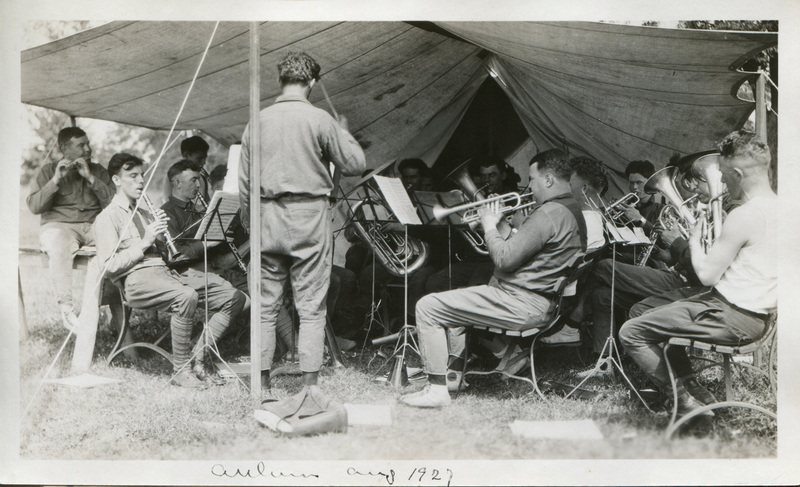 From Charlie Gallagher: St. Ann's Band, 1918. 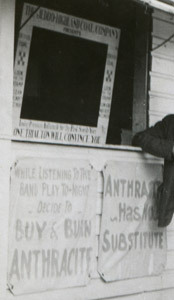 Charlie doesn't know the location shown here. 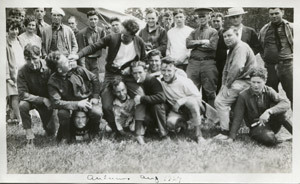 Another photo from Charlie Gallagher. 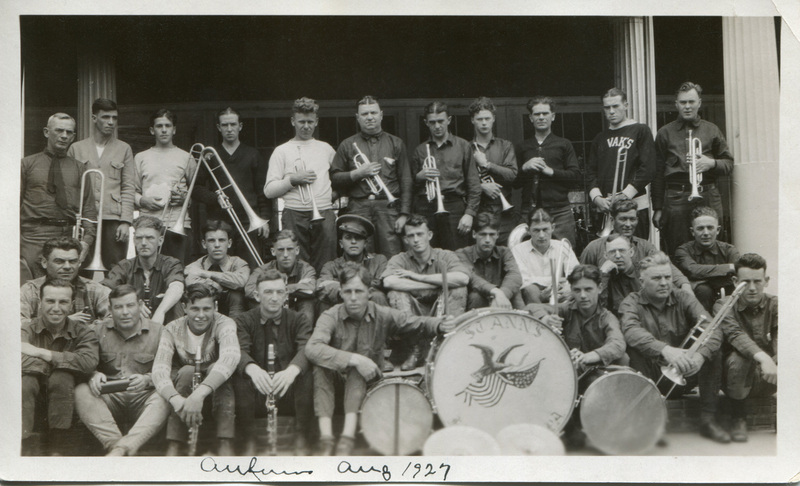 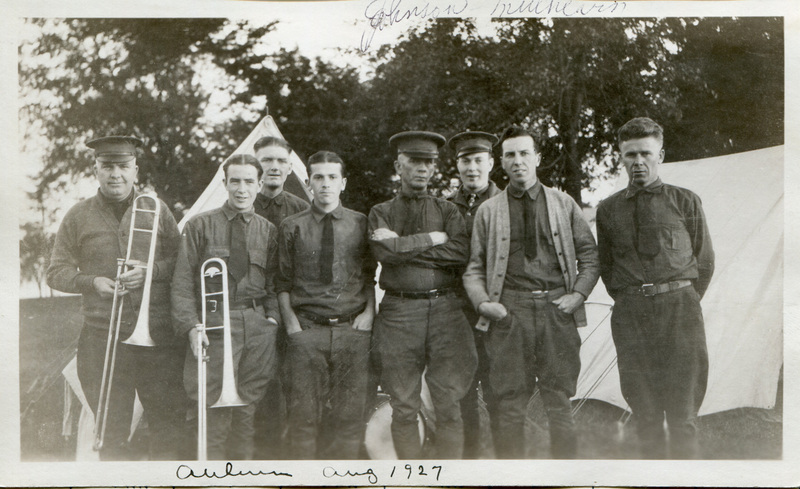 "Back row second from left my Grandfather Bernard Gallagher (trombone)." 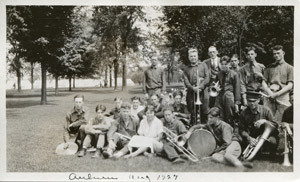 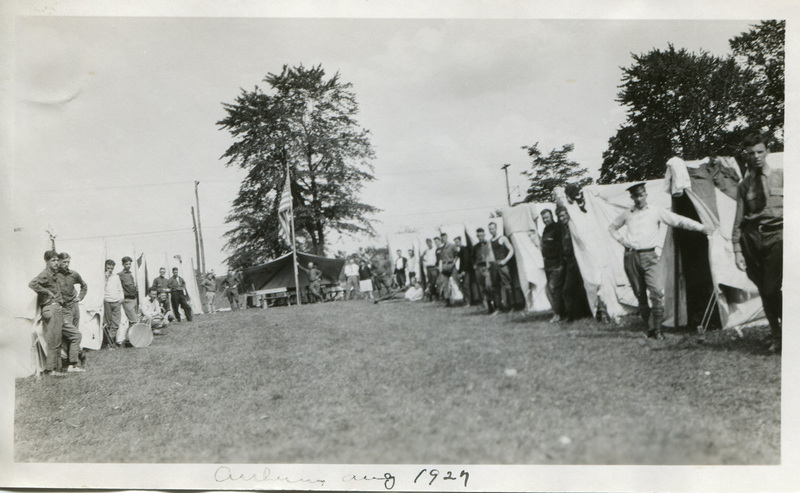 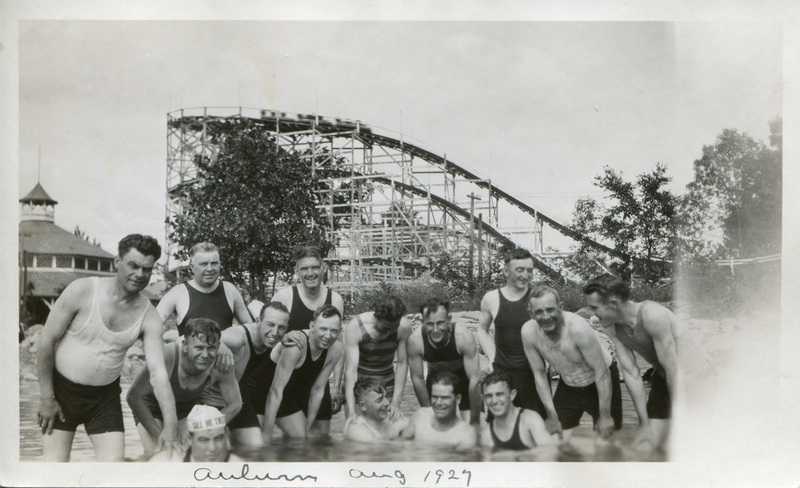 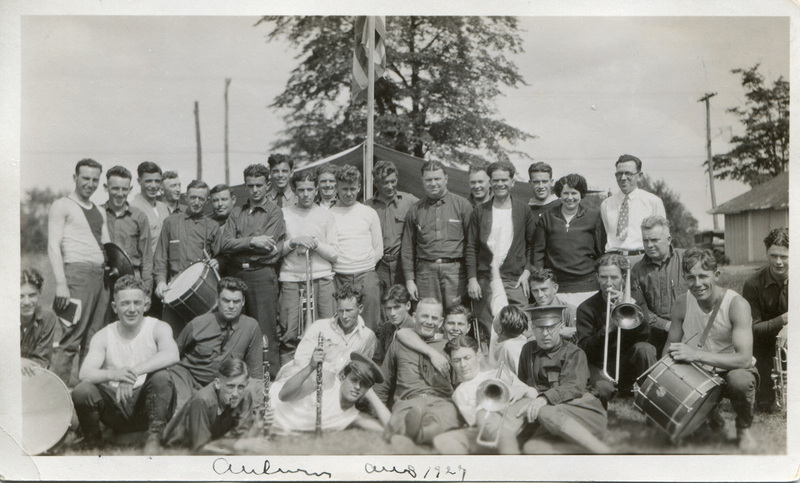 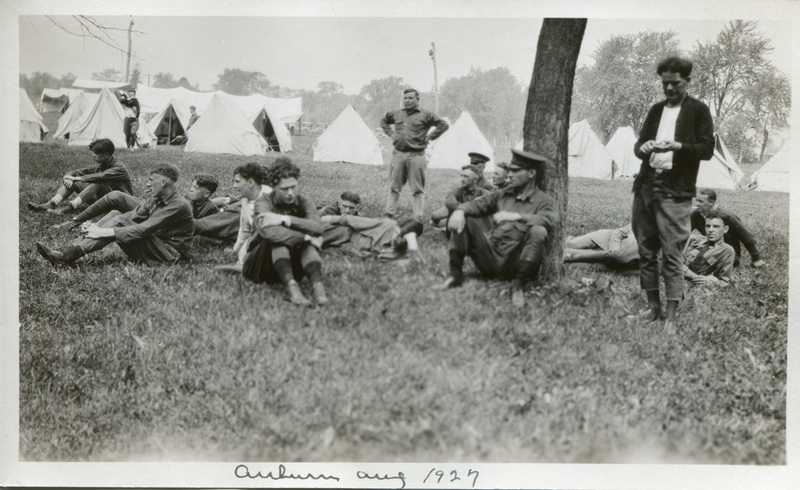 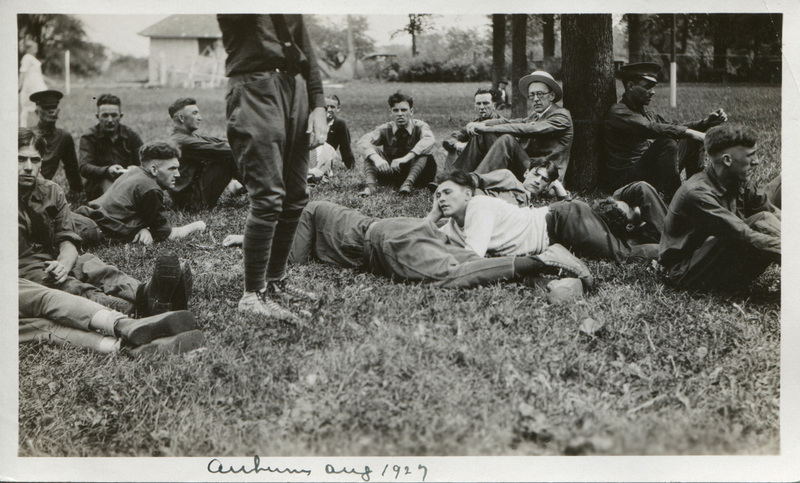 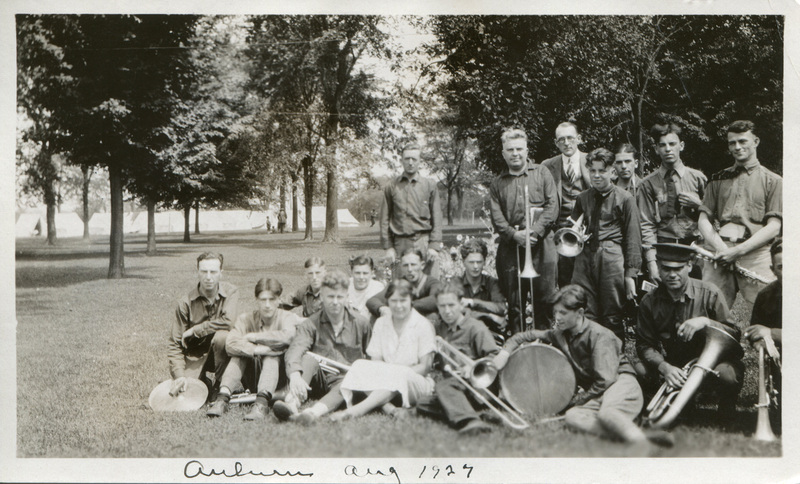 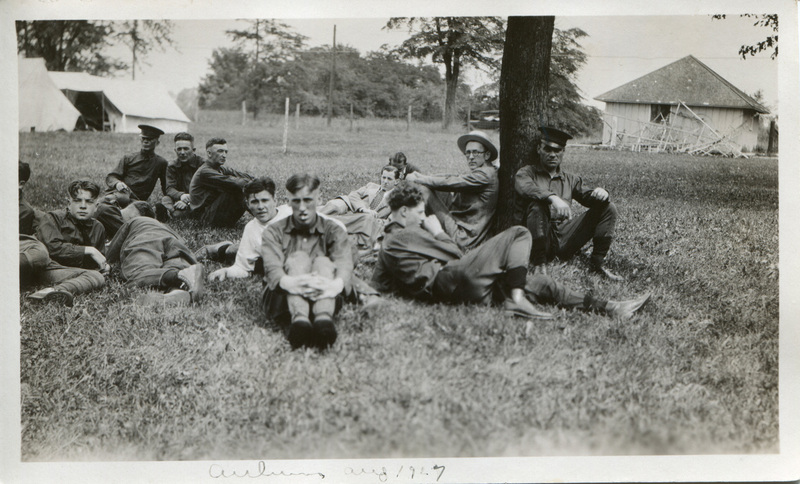 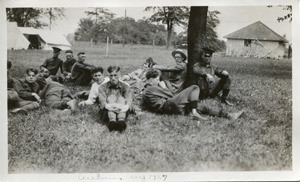 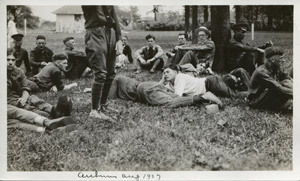 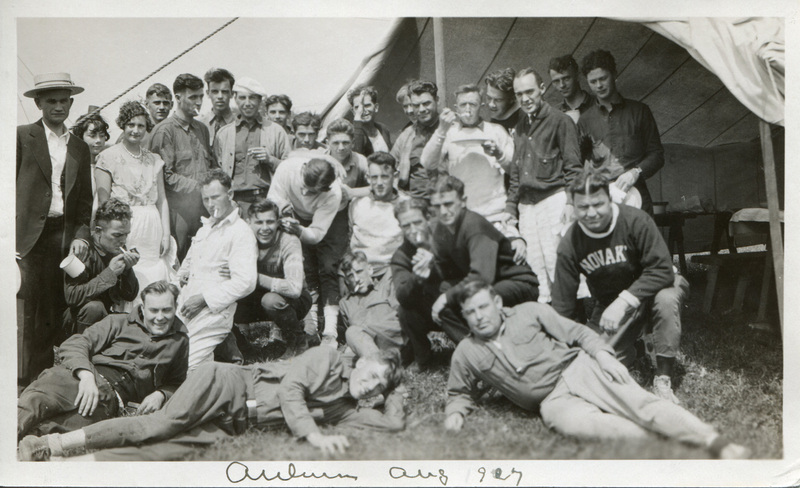 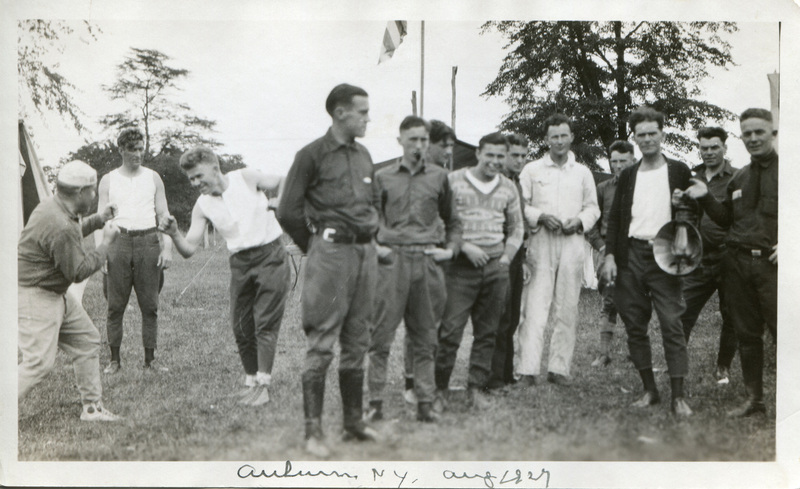 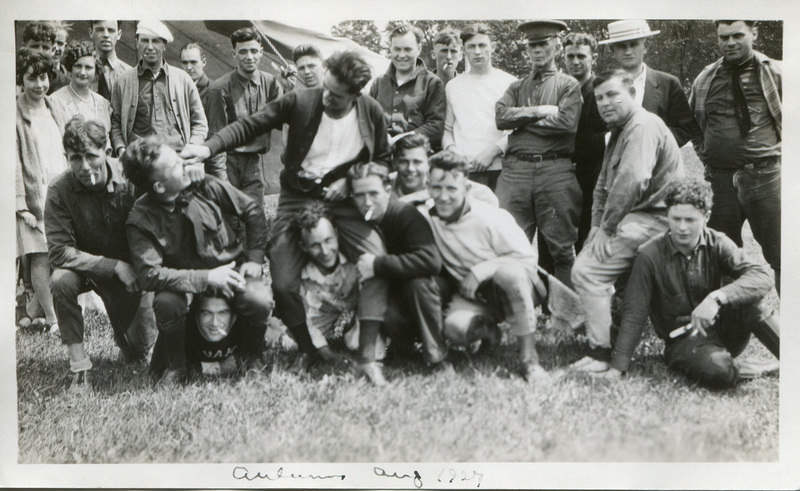 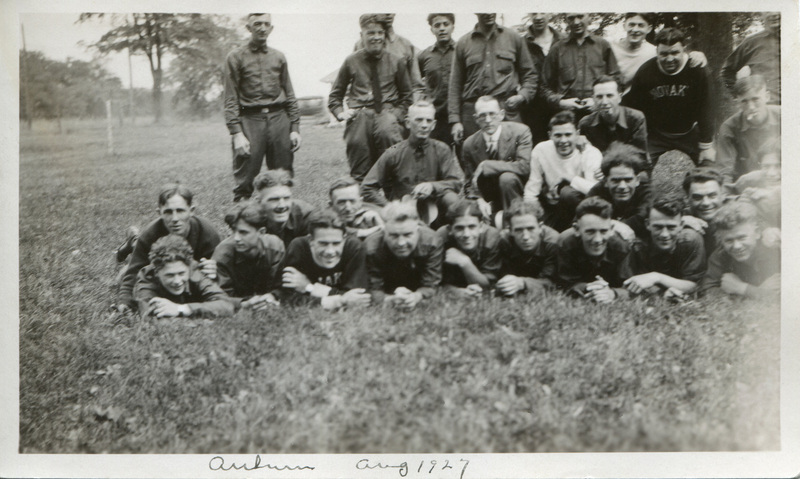 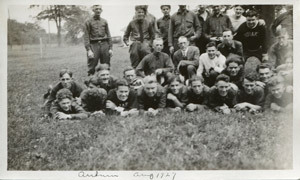 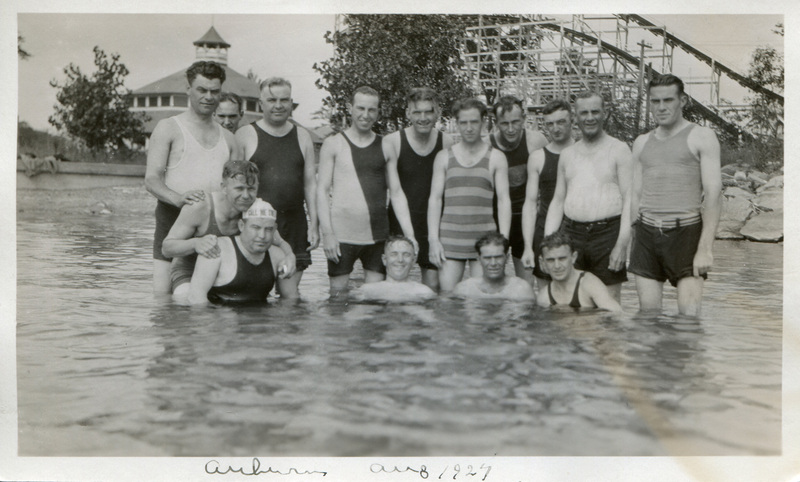 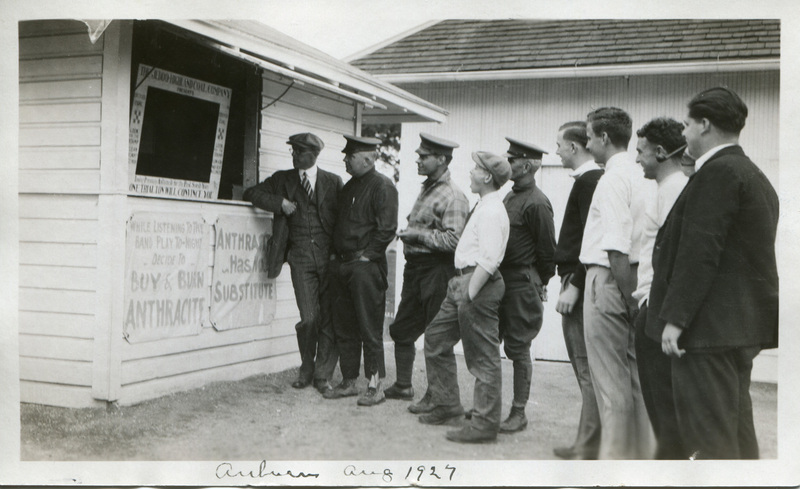 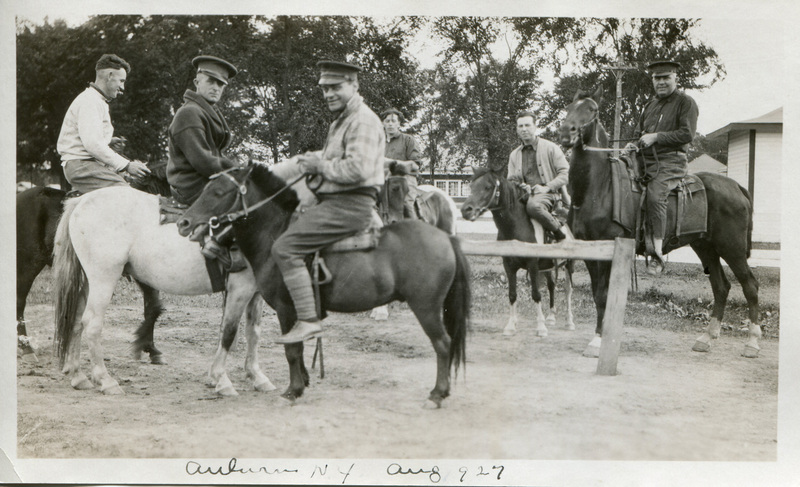 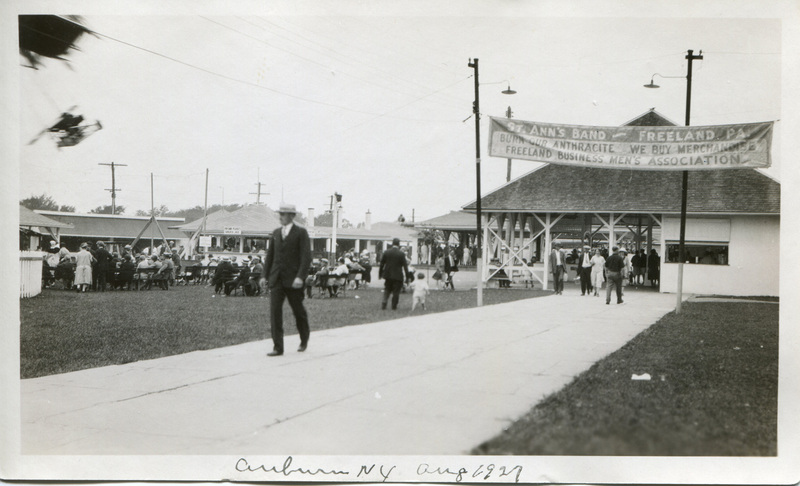 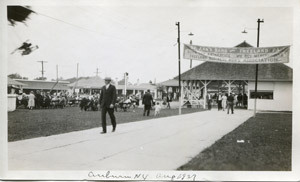 These 1927 photos are from Charlie Gallagher, who wrote: "Every August they went to Auburn N.Y. to play." Left photo above: Charlie's Grandfather Bernard Gallagher is second from the right in the first row. 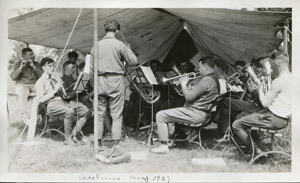 Left photo above: Bernard Gallagher Jr. on right (with trumpet); Bernard Gallagher Sr. next to him; both are just behind the drummer. 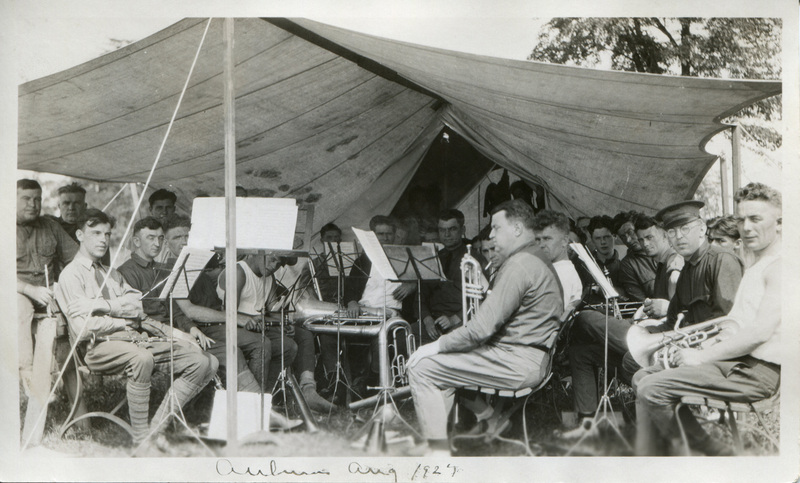 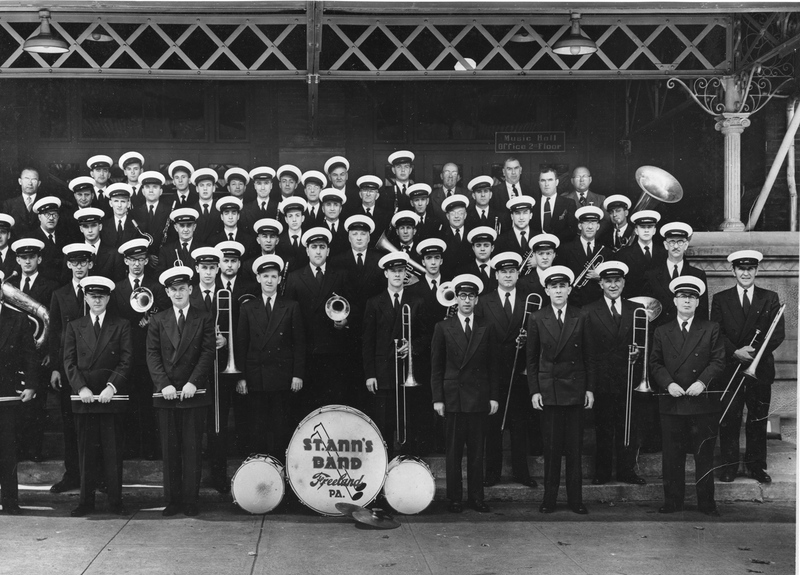 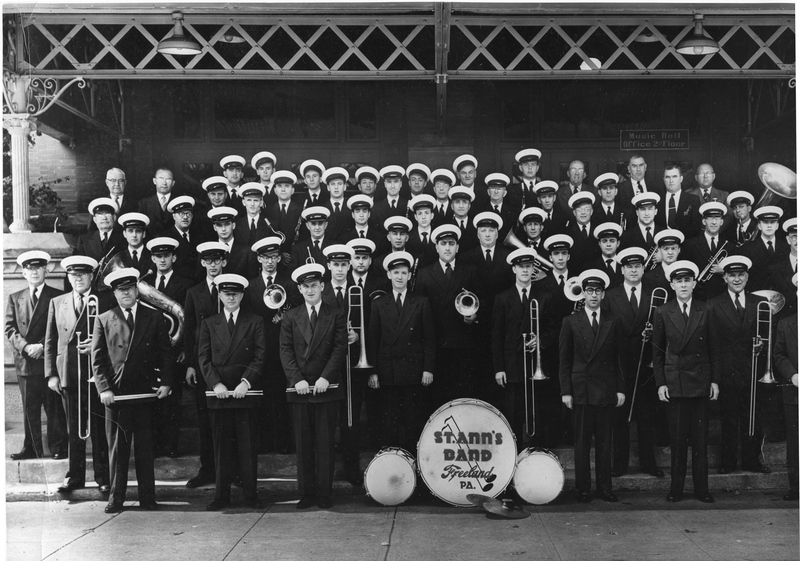 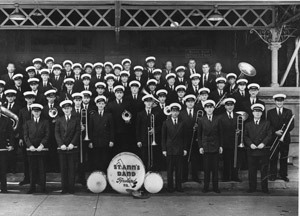 Right photo above: Bernard Gallagher Sr. standing in center with trombone; Bernard Gallagher Jr. to his right with coronet. 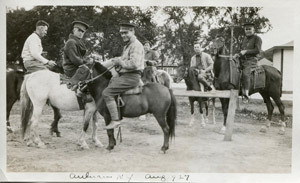 Left photo above: Bernard Gallagher Sr. third from the left standing. 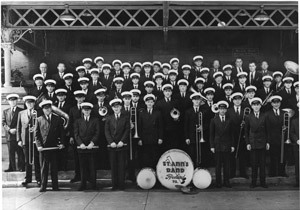 Center photo: Bernard Gallagher Sr second from the left standing. 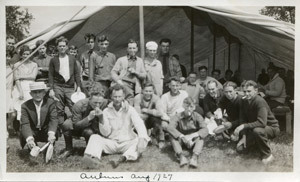 Right photo above: Bernard Gallagher Sr. 4th from the left front row. Right photo above: Bernard Gallagher Sr far left. 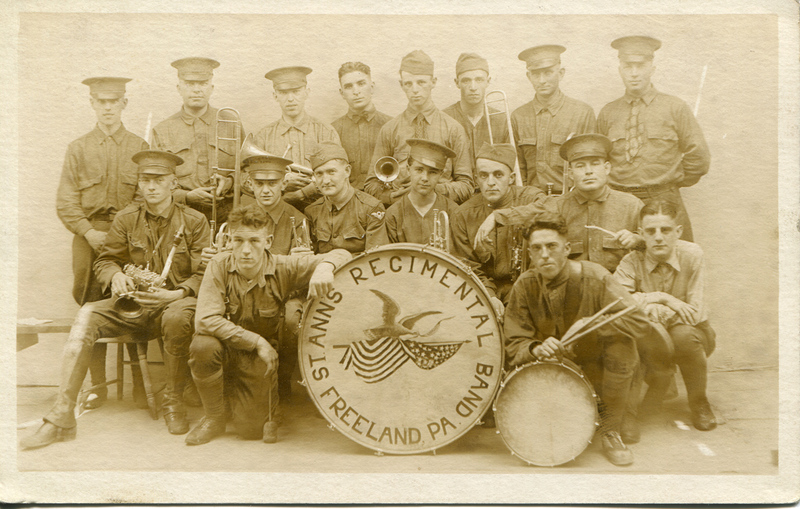 This photo comes from Colleen Tatar, who got it from her father. 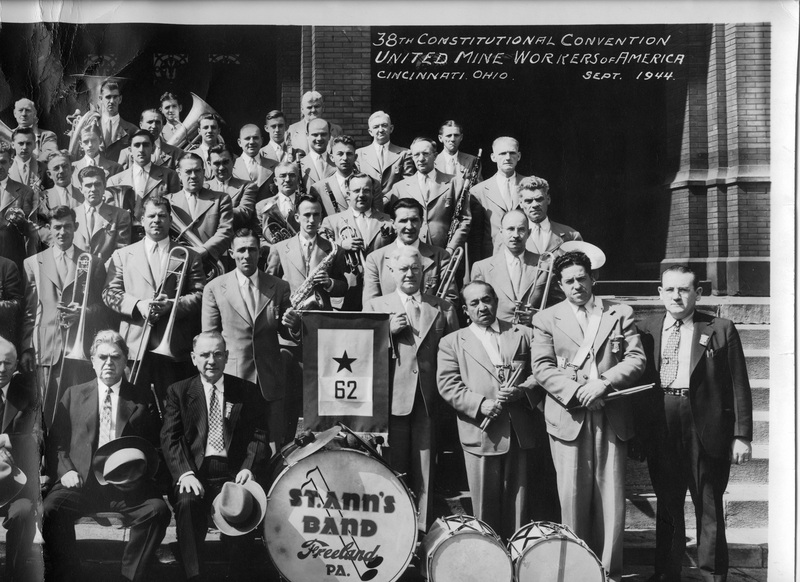 38th Constitutional Convention, United Mine Workers of America, Cincinnati, Ohio 1944. 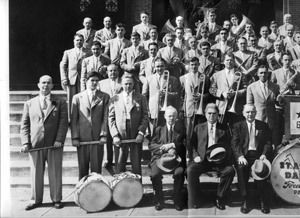 Charlie Gallagher adds, about the left half of the photo: "Well, that’s John L. Lewis (second from right in the front row)." This photo comes from Colleen Tatar, who got it from her father. 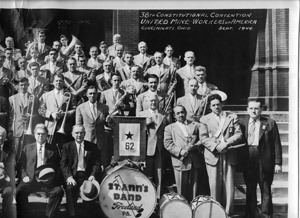 41st Constitutional Convention U.M.W. 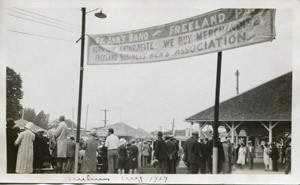 of A., Cincinnati, Ohio 1952.